Some of my best memories of Christmases past revolve around the much-anticipated box of Christmas cookies sent to us every year by Grandma. This magical brown cardboard box, which may have been any size but always seemed very large to my child self, contained within it enough combinations of butter, sugar, and flour to send us bouncing off the walls. Each and every cookie was individually wrapped in plastic. This was because in order to make enough cookies to fill four huge boxes for all her sons and grandchildren, Grandma had to start baking cookies months in advance. When the cookies were finished, she would wrap each cookie in plastic wrap and freeze them. This way, when December rolled around, all she had to do was put them in cute packaging and ship them in the mail. She put so much love into each cookie, you could taste it. Just thinking about that box of cookies makes me so happy and so wistfully nostalgic. It was one of the sweetest, most loving gestures- and we were so happy and grateful to receive them. I don’t remember all the cookies she would make- a wide variety- but I remember kifli (of course), sugar cookies, maybe bars of some sort, peanut brittle, jam thumbprint cookies (I think), and primarily, I remember my favorite cookie of them all: chocolate kiss cookies. Now any other time of the year I would tell you that kifli is my favorite cookie, hands-down. But during Christmas time, chocolate kiss cookies take the top spot in my cookie heart. 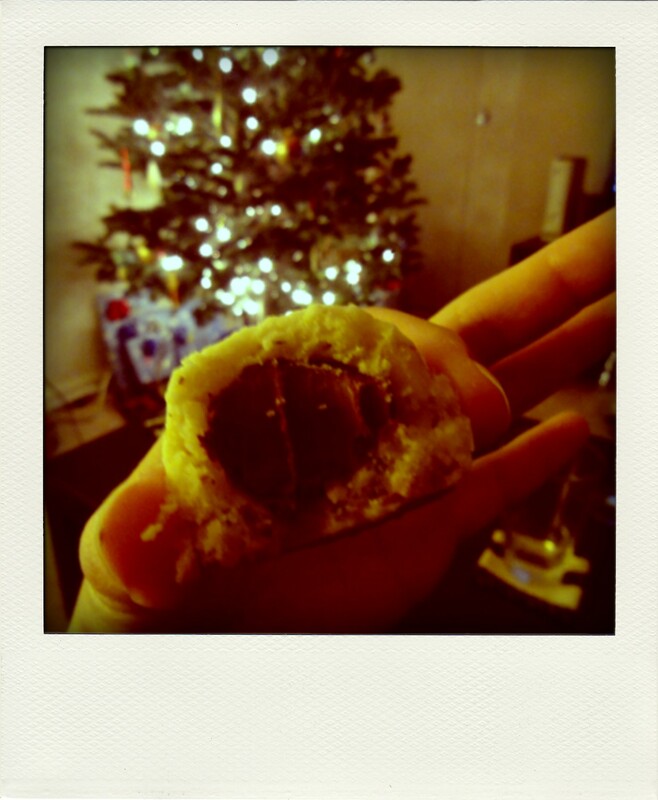 They are like a pecan sandie- with walnuts- plus a creamy sugar coating and a soft chocolate center. They melt in your mouth and have the perfect vanilla-nut-chocolate flavor combo. Plus, they are very easy to make- an important quality to have during the hectic holiday weeks. It had been years since I last had them, and I was eager to make them again. 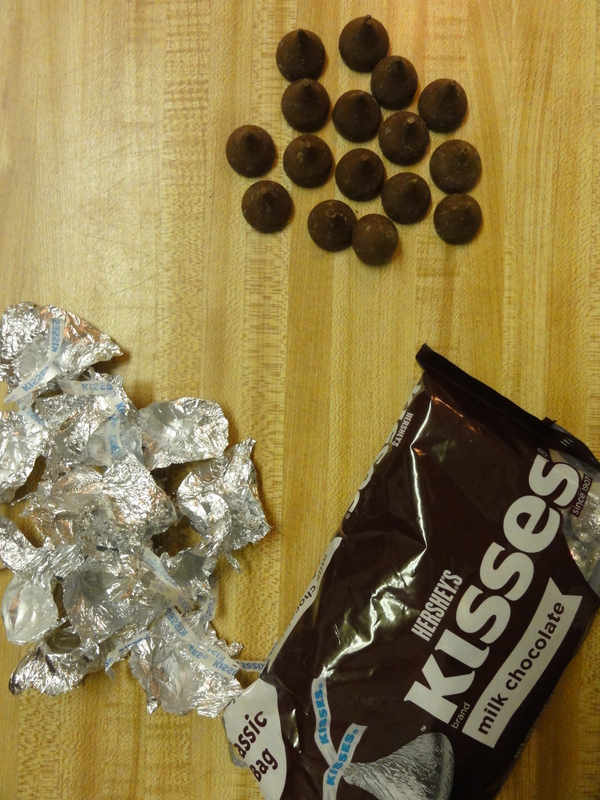 Sadly, the recipe for these chocolate kiss cookies is currently lost. They are not Hungarian, so they are not in my pile of Hungarian recipes that I have from Grandma. There are other non-Hungarian recipes in the pile, so I thought it might be there, but no. My Mom swears she has it somewhere (and I’m sure she does), but after an hour of searching she came up empty. HOWEVER, my Mother is incredibly resourceful, and after five minutes of searching online she emailed me a link to a recipe that looked exactly like the cookies Grandma made. 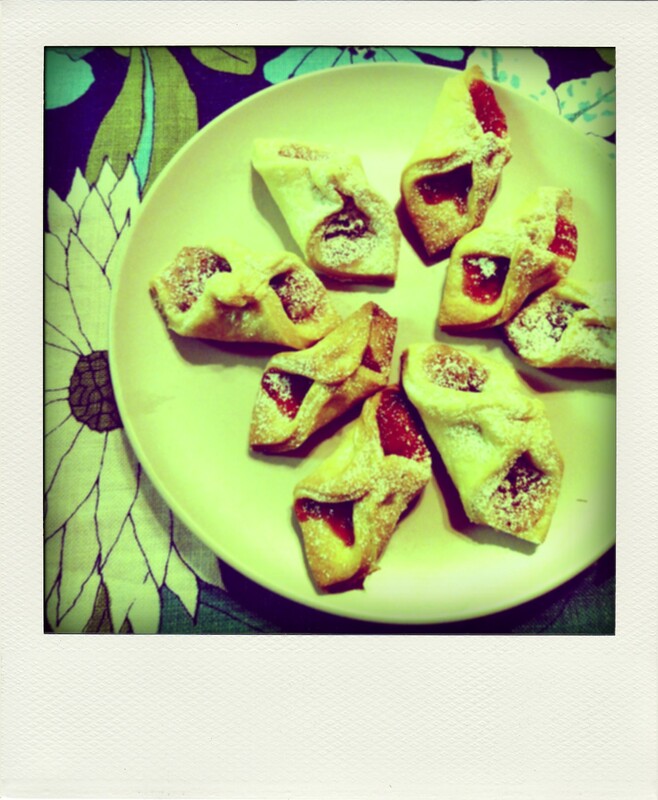 I made them, and was thrilled to find that they also tasted exactly the way I remember. 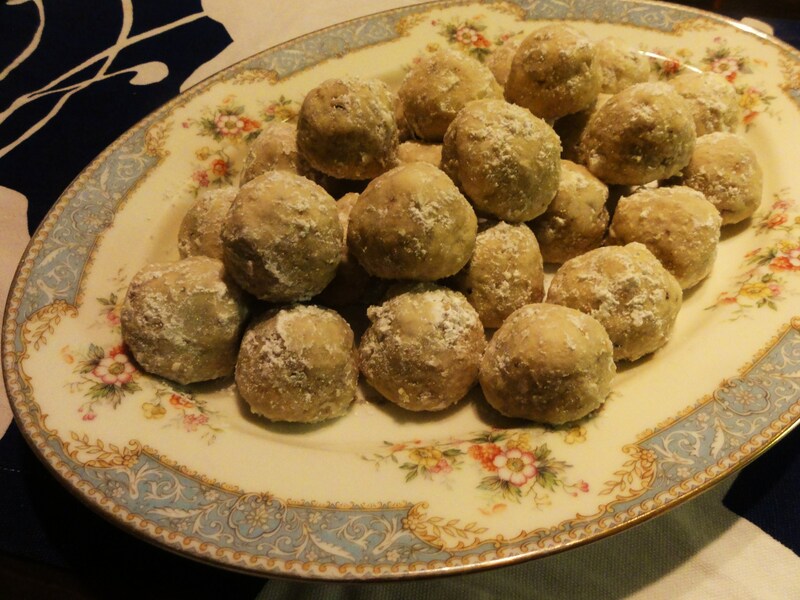 I even rolled them into balls like Grandma did, and next time maybe I’ll make them with some fancy chocolate. For now, I will just provide you with the link to the recipe on AllRecipe.com. I will have to tweak it (if any tweaking is even possible- it’s already so delicious!) and re-post in the future. Once you make a batch, here’s the best thing to do: take the cookies (or the whole box if you receive a box of cookies in the mail from your Grandmother), put on your best flannel pj’s and warm jackets, pile the whole family in the car, and drive around your neighborhood together, eating cookies and looking at Christmas lights. This was my family’s tradition every year, and between the cookies and the Christmas lights, it’s no wonder I thought that box was pure magic. Merry Christmas, Hanukkah, Kwanzaa, and Happy New Year! p.p.s. Hey cousins- do any of you have special memories, photos, or traditions surrounding the Christmas cookie box from Grandma? Any special Christmas cookie recipes you want to send me to share next year? Today (and probably tomorrow as well), Misha and I are confined to our apartment as Hurricane Irene bears down on Baltimore. We had planned to be at a barbeque in PA this weekend, but alas the weather had other ideas. The upside is some much needed rest and downtime after a long and tiring week. 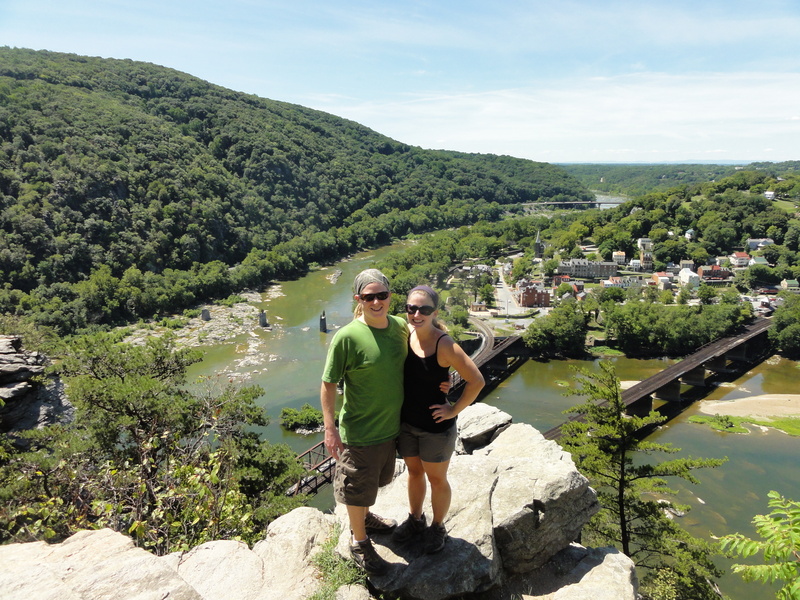 On Tuesday we went on a hike in Harper’s Ferry, West Virginia. Our hike was fun and the day was beautiful, and I ended up spending all the energy I had for the week, leaving me a bit sluggish for my three opening shifts at work. We also found out this week that due to a huge maintenance problem in our apartment, we are going to have to move into the apartment next door in two weeks. I will be happy to have a new, clean apartment with no maintenance issues, but moving is always stressful and now we have to do some packing. I am almost relieved to be stuck inside, reading and relaxing and catching up on my blog posts! 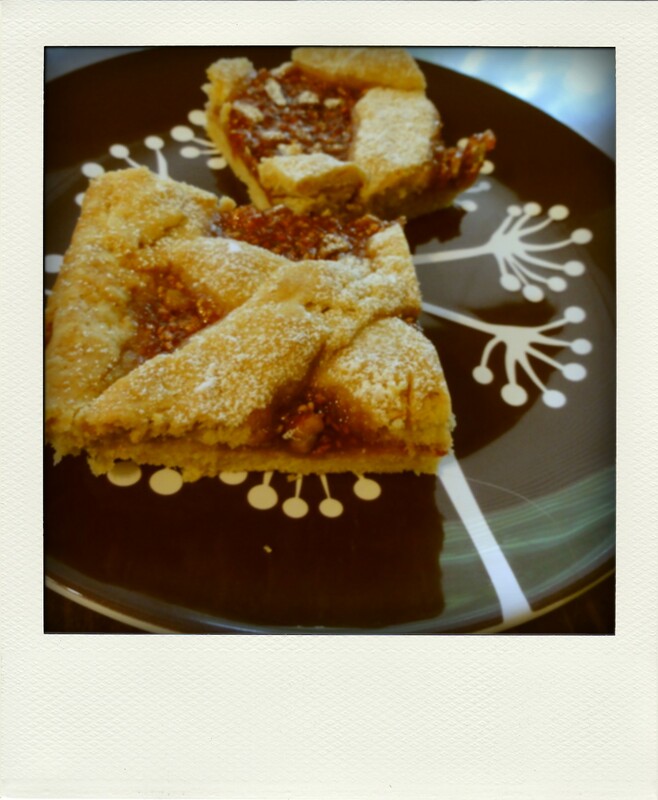 I made these raspberry squares about a week and a half ago, and have been so busy that I am just now getting around to sharing them with you. They are basically the same dough as kifli, just rolled flat, topped with criss-cross pieces, and cut into bars. It’s wonderful how the same recipe can take on such a different feel and attitude just by cutting and shaping it differently. They also have a very satisfying amount of jam on them, and are just as wonderful for breakfast as they are for dessert. Fresh out of the oven, beautiful and golden brown! When I made them, the dough got very, very sticky. If it does this for you, do not be concerned. It will be sticky and messy, but they turn out perfectly buttery and flaky. 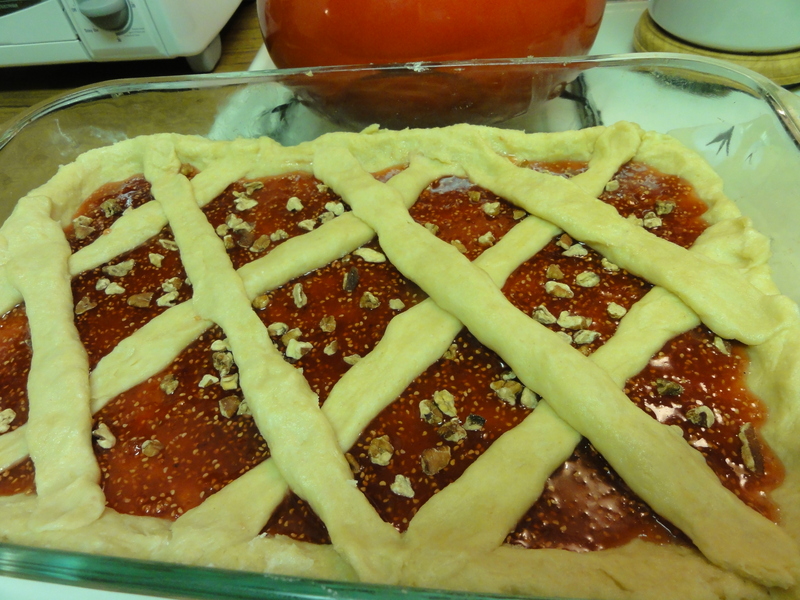 The best part for me was that I got to use our homemade raspberry jam for the filling. Of course that being said, any jam will do, so long as it is sweet and tasty to your liking! 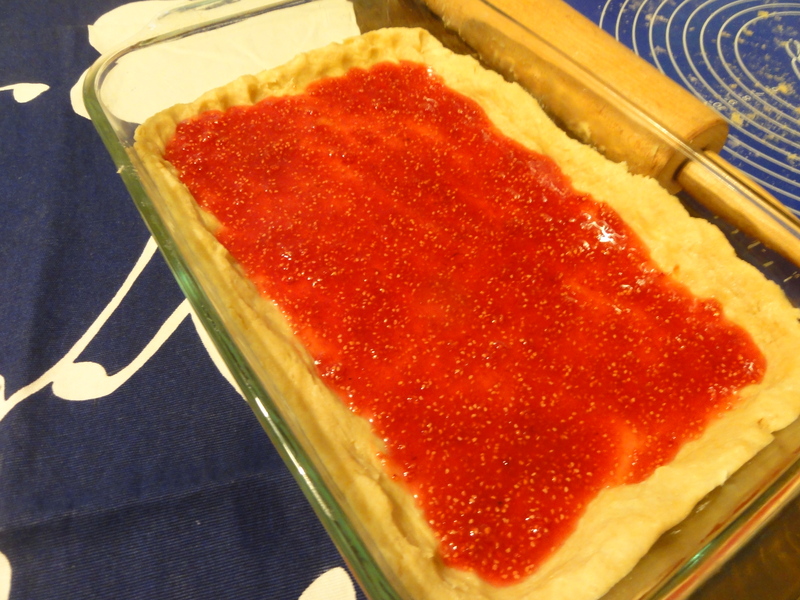 Grandma called this recipe “Raspberry Squares (or Lekvaros)”. Lekvar is a Hungarian word referring to thick fruit butter, and Grandma uses it to refer to all jams and fruit purees used in her recipes. I think it would be interesting to try making these with apple butter- considering how much real butter is in them, I’m sure it would be very decadent! Remember, if you make any of the recipes I share with you here, feel free to share pictures and stories, or any tips or questions you have along the way. 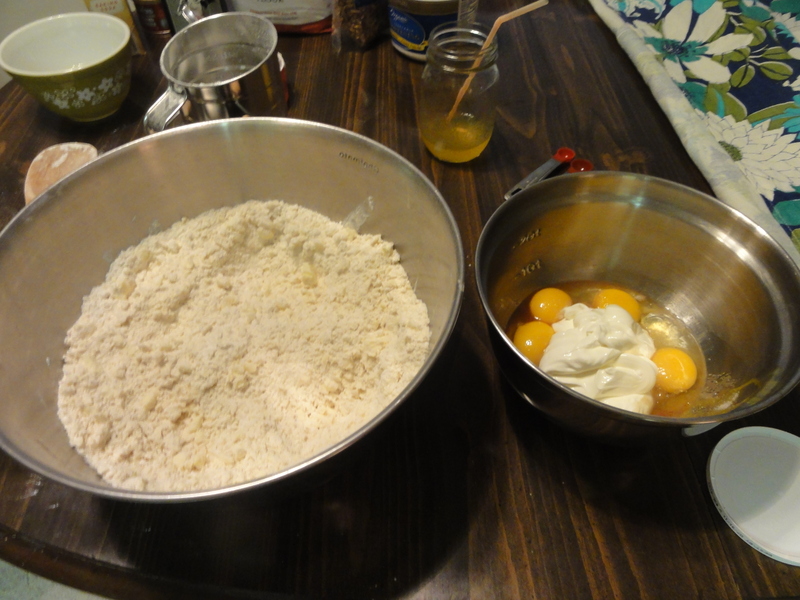 Measure and mix together in large bowl the flour, baking powder, and salt. 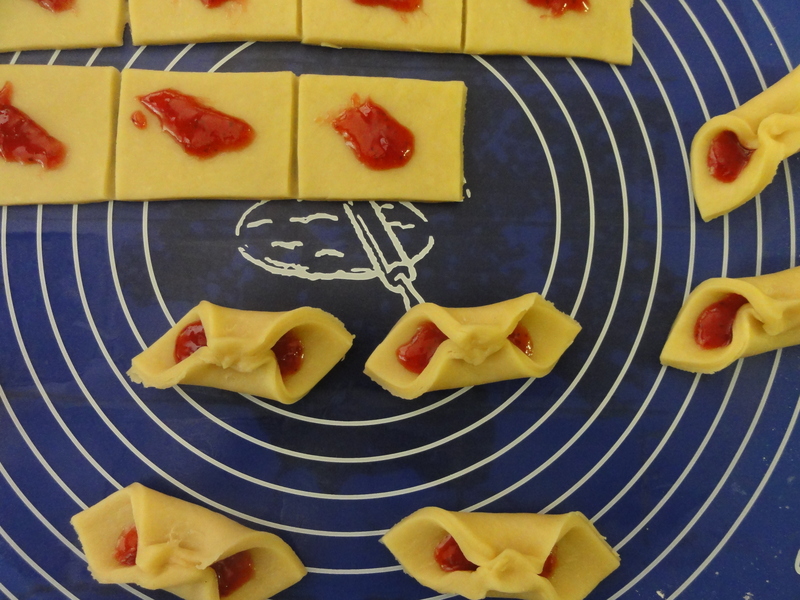 Cut in shortening using a pastry cutter (a fork or your fingers would also work). 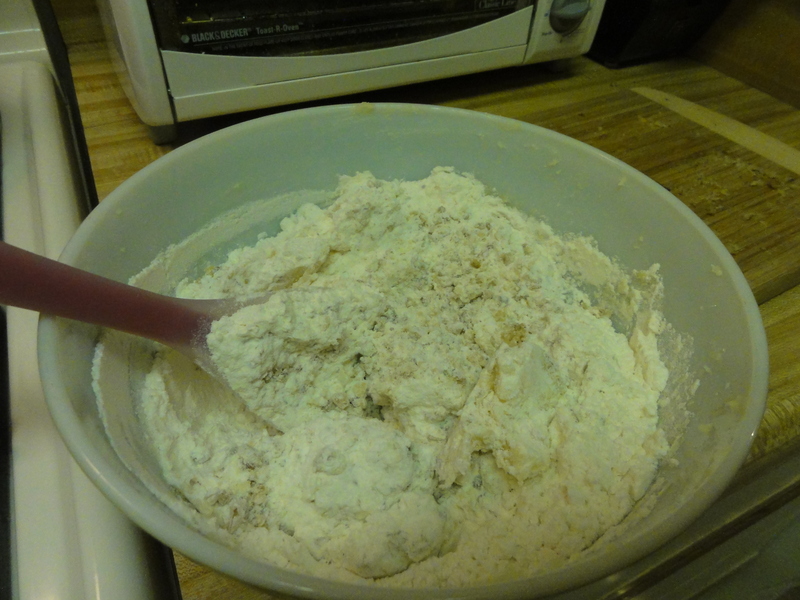 Mix the beaten eggs with the milk, and then add to the flour mixture. Knead into a soft dough. If the eggs are small, more milk may be needed (be careful here if your butter is not soft yet- I thought I needed a bit more milk, but once my butter warmed my dough got sticky). Once you have a soft dough, set aside about ¼ of the dough. Roll out the rest and spread evenly in a large pan (I used a glass 9 x 11 pyrex pan), using a spatula to help if necessary. Press dough well up along edges of the pan so that there will be an edge of dough all around. Spread on the jam, sprinkle on the nuts. Pinch off pieces of the reserved dough and roll with your hands on a lightly floured board into strips ½ inch wide. You will want to make them varying lengths depending on which section of the pan you are laying them across. Place them on top of the jam, crisscrossing, about 1 ½ inches apart. Bake at 350 for 45 minutes, or until golden brown. Dust with powdered sugar. Slice into squares with a very sharp knife and serve. Store in an airtight container. On June 22, 2011, my Grandmother, Margaret Helen (Szabo) Elek, passed away. She was 89 years old- just two months shy of her 90th birthday. 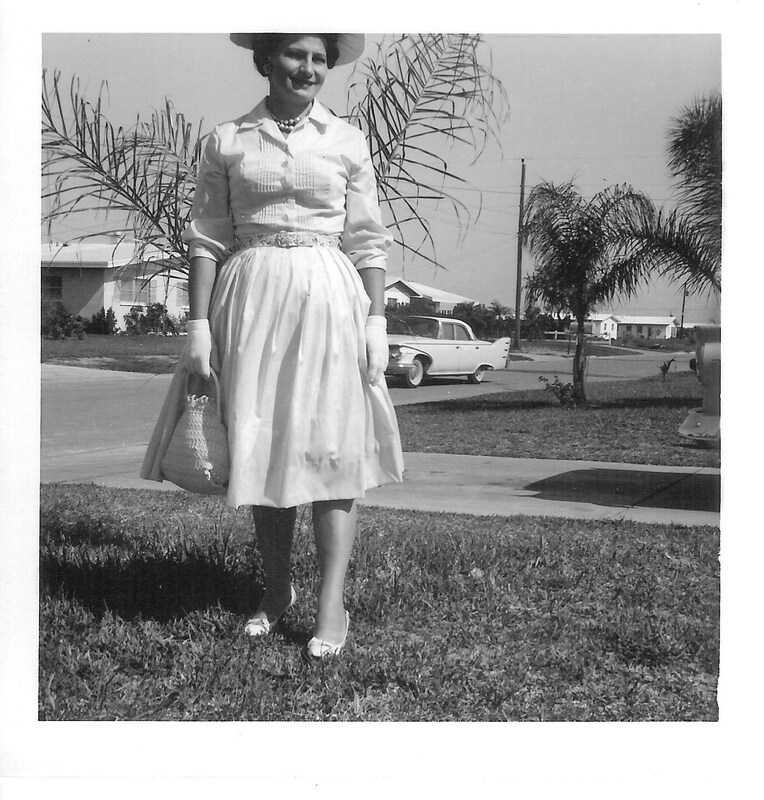 Coincidentally, and somewhat strangely, when she passed I was in the process of sorting through old family photos, looking for pictures of her for this blog. While I’m sad she is gone, I am happy to be starting this blog inspired by her, and to continue cooking and baking in her memory. Through sharing her recipes, I am keeping her spirit alive. 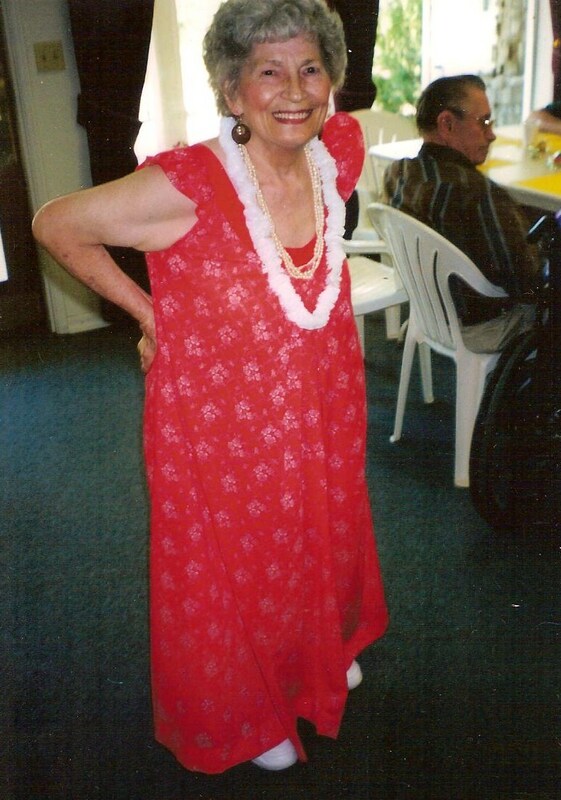 Her funeral was held in Fresno, California, and due to the skyrocketing price of plane tickets these days, I was unable to join my family to say goodbye. 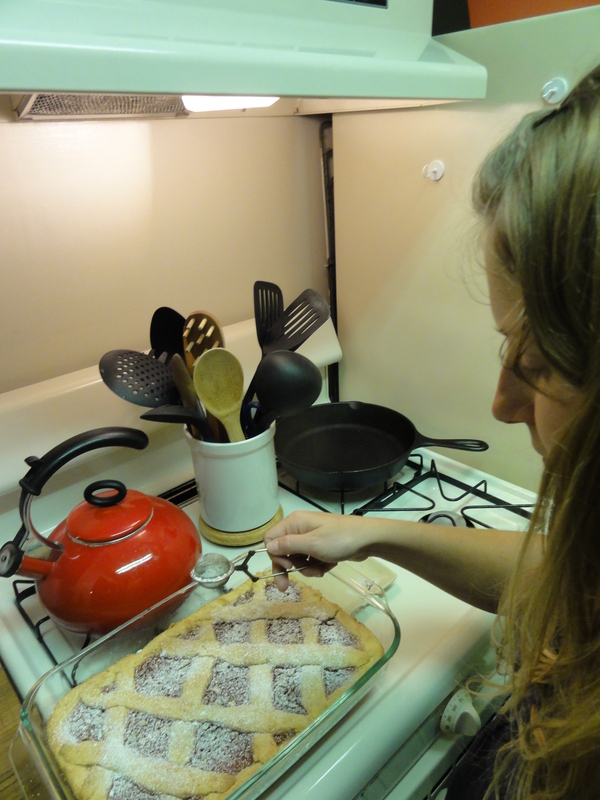 I thought the best way to say goodbye here at home was to bake some kifli. Kifli is my all-time favorite pastry/cookie, and was one of my Grandmother’s favorites as well. 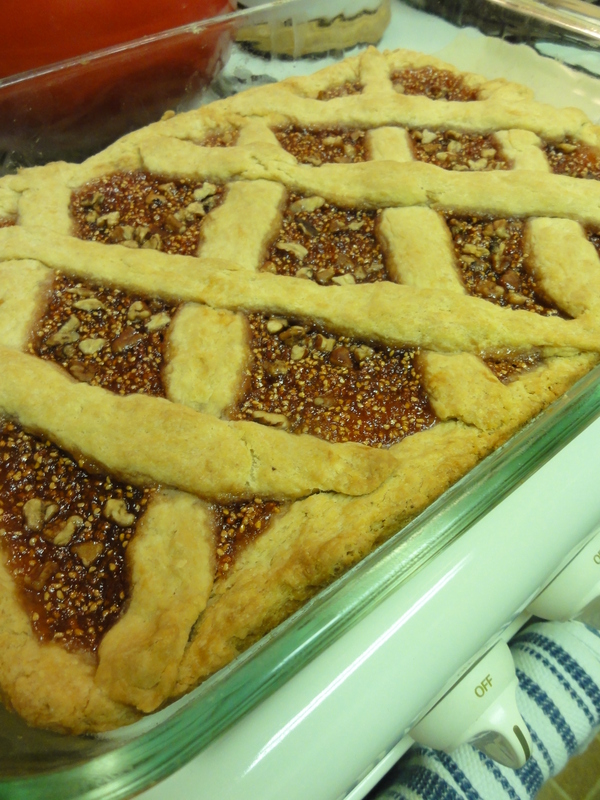 It is a buttery, flaky, dough cut into squares and then filled with all sorts of different deliciousness: nuts & sugar, prune jam, raspberry jam, apricot jam (jam is sort of a theme), or really anything you can think of. You then pinch two opposing corners of the square together and voila!- weird horn shaped cookies oozing sweet goodness. 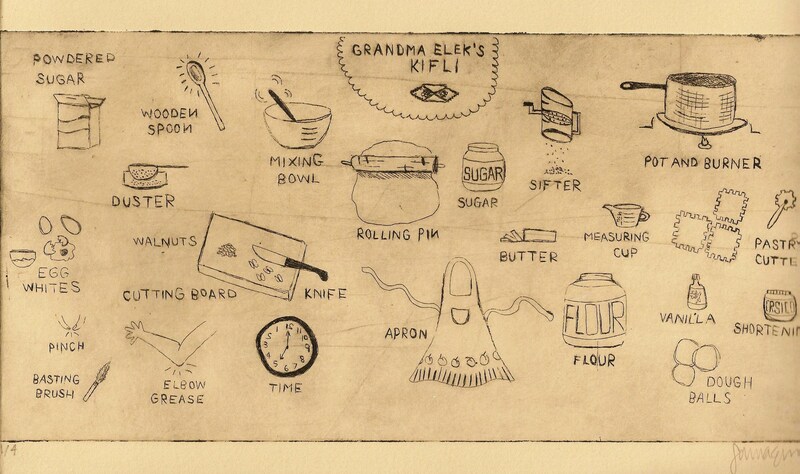 Grandma made kifli for us, but it was my Mom who taught me how to make it. Fact: it takes years to perfect the making of kifli. Even though I know the principles, and have made it many times before, I still have issues every time I make it. At least they are usually different issues, which makes me more confident that one day I will make kifli as thin and perfectly proportioned as my Grandmother’s and my Mom’s. For now I am content that no matter what I do wrong, they still come out tasting like Heaven in a cookie. This time, my mistake was in the rolling of the dough. I did not manage to get it thin enough. 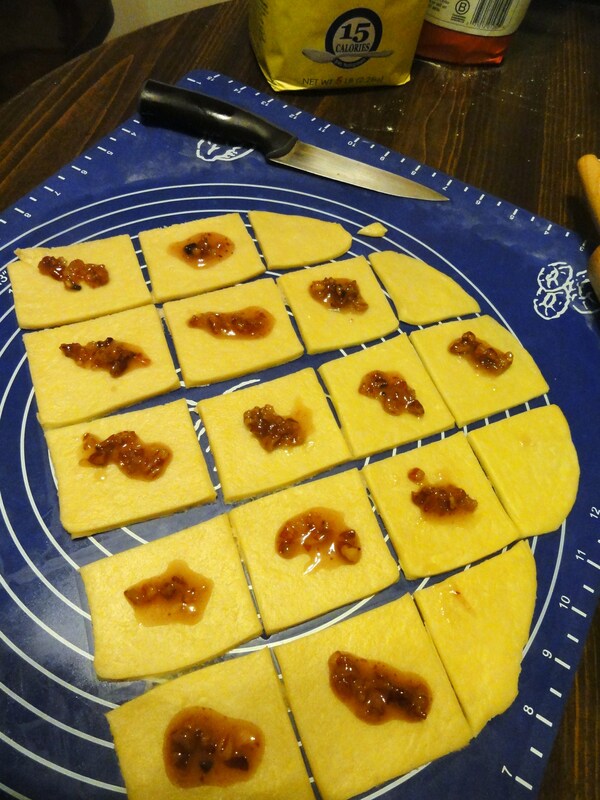 My Dad told me that Grandma used to roll and roll and roll and roll that dough, until it was as thin as possible, and only then would she cut the squares and fill them. Apparently there is more emphasis on the rolling aspect than I ever realized. I feel like it hasn’t been that hard before, so maybe there was somehow too much baking powder in them this time, but regardless they just puffed up and popped open so badly when I baked them! When you ate one, there was a little too much cookie and not quite enough filling. On the up side, this didn’t seem to stop anyone from enjoying one. And then another. And then a couple more. So be warned, if you make kifli, they will be a challenge and a time commitment, but no matter what in the end you will have a highly addictive and fantastic cookie. Please share your kifli experiences and pictures in the comments section when you’re finished! Thank you Grandma, for all your cookies and your love- you will be missed! A print I did in college about making kifli- I would love to re-do this print and add things! In a large bowl, measure and sift together flour, salt, baking powder and baking soda. Using a pastry cutter*, cut in butter and vegetable shortening until the mixture is coarse like crumbs. In a separate bowl, slightly beat egg yolks, whole egg, vanilla, sour cream, and sugar. Pour egg mixture over flour mixture and mix thoroughly. The mixing will get very tough. 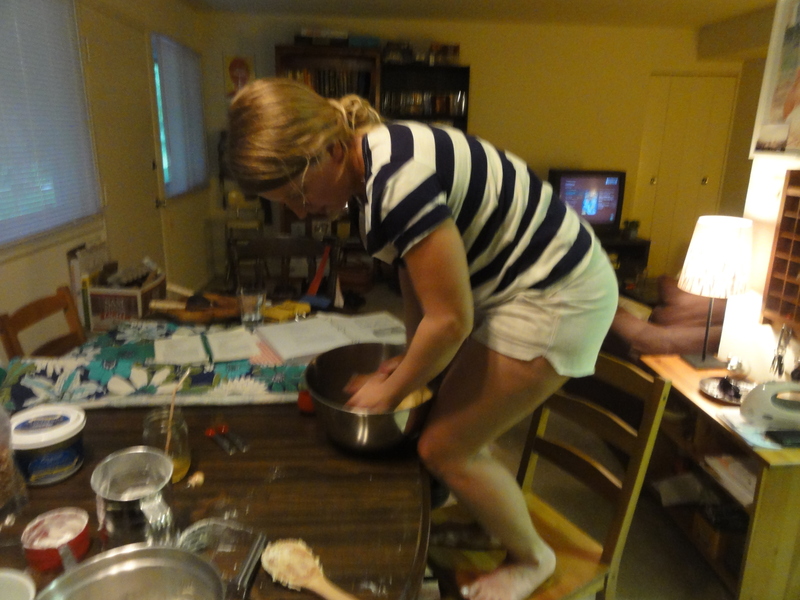 Eventually you will have to use your hands to finish mixing and kneading the ingredients into a soft dough. When you have a good dough formed, flour a large wooden board, pastry mat, or flat surface and use a rolling pin or an empty wine bottle to roll out THIN. Super duper thin. You will probably need to separate the dough into multiple balls and do them one at a time. Using a sharp knife or decorative wheel pastry cutter*, cut into 1-2” squares. Spoon a small amount (about ½ a tablespoon) of your favorite filling onto each square. Prune jam is the most traditional and was Grandma’s favorite, but you can also do any other flavor of jam, such as raspberry or apricot. My favorite filling is nuts & sugar. To make the nuts & sugar filling: chop 1-2 cups of pecans finely. Heat in a saucepan over medium-low heat with about a cup of water, a cup or two of sugar, and a couple tablespoons corn starch, stirring continuously until the mixture begins to thicken. You can make it as thick as you want, but you don’t want it to be too thin. You can also alter the amounts of each ingredient depending on how much you need and how sweet or nutty you want it to be. Pinch two opposing corners of the squares together. Make sure you pinch them really well so they don’t pop open when baked. Using a pastry brush or paper towel, brush with egg white or one whole egg beaten. Bake on a greased baking sheet at 350 degrees for 20-25 minutes, or until slightly brown on the bottom. Cool on wire rack. Dust with confectioner’s sugar (I like to use a metal tea ball for really even dusting). Makes a couple DOZEN cookies. Store in airtight container, and share with family and friends! *There are two different tools that are both referred to as a “pastry cutter”. One is a half-oval shaped tool that is used to “cut” butter or other shortening into a flour mixture. The other is similar to a pizza cutter, a wheel on a handle, that is used to cut pastry dough into shapes, often with a decorative edge. If you are serious about baking, a pastry cutter for shortening is a must-have tool. I do not have a decorative pastry cutter yet, but if you do it makes a very pretty cookie!